FANTASTIC LOCATION! Aquarius 3 building built by award winning developer Concord Pacific. 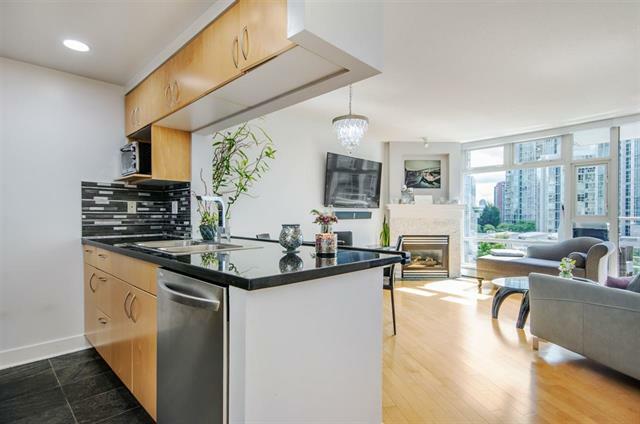 This beautifully 885 sqft renovated 2 bed 2 bath unit is turnkey. Updates include all the flooring, New SS appliances, new washer/dryer, updated fireplace, custom shelving in den, custom built in closets, bathrooms updated, new designer blinds in all rooms and list goes on! Seawall, marina, parks, and restaurants just steps away, Urban Fair is downstairs, Elsie Roy Elementary School 1/2 block away. This is a true gem and must see in person.